At Saintfield High School we earnestly endeavour to provide all of our pupils with a holistic educational experience. A central aspect of this provision is ensuring high levels of pastoral care for every child in our school community. The pastoral journey has been based upon feedback from parents/carers, pupils and staff, and we are confident that it will provide pupils with a wide and balanced insight into a range of relevant issues. We earnestly hope that such provisions will equip your child with resilience and the ability to make well thought out and informed decisions. Furthermore, and most importantly, we hope this pastoral programme will contribute to your child being happy and content both inside the classroom and out. 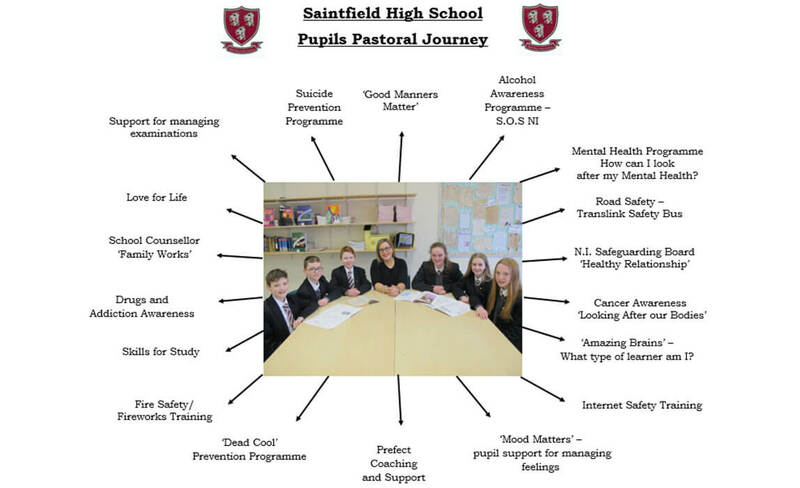 Please see below an overview of the pastoral experience that your child will be offered during their time at Saintfield High School.